Qingdao and Dalian were our two ports of call in China before we arrived in our final Chinese port – Tianjin, where we would disembark the ship for the final time and drive into Beijing to begin our tour of China. Qingdao, or Tsingtao for you beer drinkers, a city with a large natural port was little more than a sleepy fishing village until the Germans won a concession from the weak and corrupt Qing Dynasty, giving the German’s a 99 year lease on the city of Qingdao, and a zone of 117 square miles. The Germans established a free port in 1899 and the city became a German military and naval support base for all of East Asia. With the outbreak of World War I, the Germans left Qingdao and the Japanese moved in and occupied Qingdao until 1922 and then again from 1938 to 1945. The Germans and the Japanese left behind several buildings which still stand, and of course, the Germans left the Tsing Tao brewery. 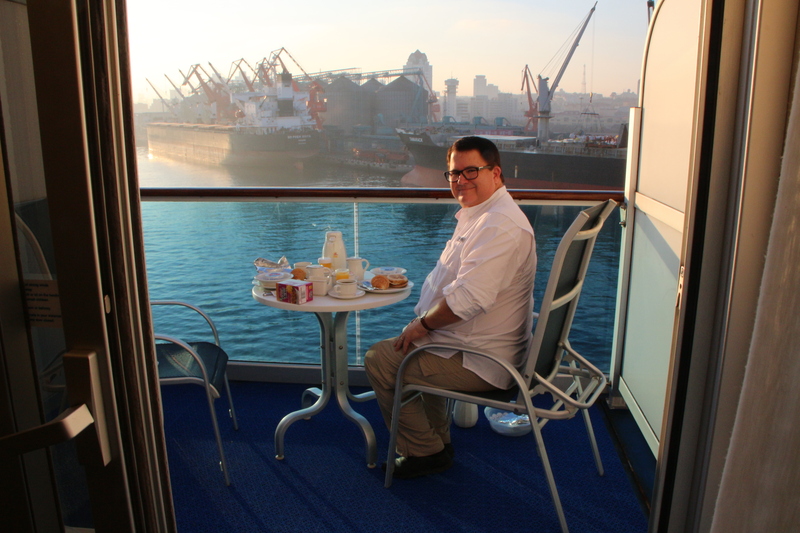 Our day in Qingdao started with the Diamond Princess pulling into the port about breakfast time. The weather has been great so, we ate outside on balcony and watched as the ship passed naval vessels, submarines and freighters. Here I am about to enjoy breakfast. Across from our ship’s dock, was this freight loading dock with these orange cranes. I thought they made a nice reflection in the water. Our first stop was the Former German Governor’s Home, built during the German occupation period. We went inside, but there were so many tour groups going through at the same time, it really was too crowded to enjoy. I’d say it’s worth a visit if you can be there when there aren’t hoards of cruise passengers parading through, which I suspect is almost every other day of the year. Holly insisted that I take some pictures of the brides we saw. Brides get to wear 3 or more wedding dresses. The traditional red dress is worn for the wedding – then during the wedding party the bride changes dresses several times. Having a “western style” white wedding dress for photos is very standard. The photography studio provides the white dress for the photos – often taken on a beach or in front of western style buildings. After the red, and then the white dress, the bride gets a dress color of her own choice – purple, green, yellow …. It’s a very big deal. After lunch our tour took us to Zhan Shan Temple, the largest Buddhist Temple in Qingdao. Again because of the holiday, there were many, many local residents at this large temple complex, burning incense and offering prayers. Qingdao is also famous for their beaches. Note the nets to keep away the sharks extending out from the beaches. Tomorrow I’ll post a shorter post about our day in Dalian. I’ve never had Tsing Tao, but I had no idea it had a German heritage. I guess now I have to try it. Also, I really hope you guys tried the quail egg thing! I did get a chance to try the quail eggs on a stick in Xian. They taste just like chicken eggs, only bite size.